Three ingredients, three food groups. Easy to make, easy to eat. These particular meat morsels are quite a bit different from my previous batch o' balls. For one thing, sausage is the main ingredient. For another thing, there's no sauce, and the only binder is flour. Those things being said, these balls are just as good as, if not better than, the saucy stuff. Most recipes for sausage balls call for baking mix, which is pretty much just flour, a leavening agent, and some form of fat. As Mamma-lama-ding-dong says, the sausage and cheese have enough fat already, so we just use self-rising flour. Also, since I'm not what one would call a fan of cheddar cheese, I'd be interested to see how these would taste with something like jack cheese. Oooh yes yes yes! I've tried something similar and it's worked a treat. What more could you ask for than a 3 ingredient meal? I have a package of sausage meat in my freezer and have been looking for something to do with it. Thanks for the idea!!! 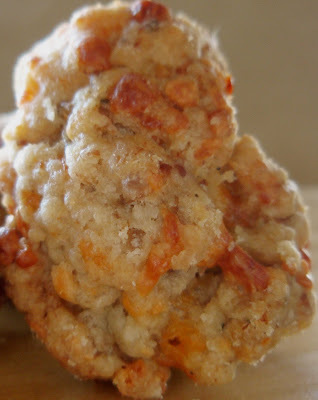 I've never made sausage balls,but this is so easy! This would be good for soup! MMMMM, I love sausage. So I know those bad boys are tasty! I love sausage! However it comes, I love sausage! You just don't need fillers when you use pork sausage - it tastes so good on it's own. Sausage and cheese together in a ball. Sign me up! use my paws? hahaha I guess I could enlist my dog for help. I am sold on anything that calls for a pound of pork sausage! I love Sausage Balls. Great with a spicy mustard too! I forgot about making these this Christmas so maybe for Superbowl...Yup! Cheese and sausage! What's not to love here. Wonderful creation...I agree with you on the sauce, none needed, at all here. Easy and delicious. Right up my alley!! I'm looking for some good football food for Thursday night so this is perfect! I made sausage meatballs once before, but they didn't have cheese. Must re-do with cheese! Meatball lover that I am - I've never made them with sausage. Sounds delicious! 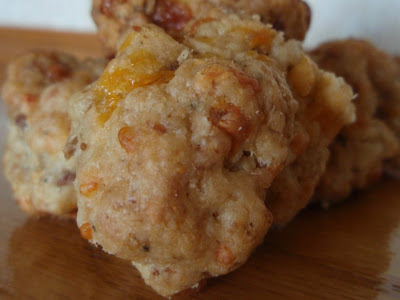 Sausage and cheese...nuff said;)Love sausage balls! Southern comfort has a new meaning...pork & cheese! Sort of like sausage gravy and biscuits but in meatball form. Well, not quite, but for some reason, that's what sticks in my head. Whatever the case, I'd eat a bunch--they sound tasty to me! I used to make these for parties, and then end up eating most of them before I even left the house. Grace, I love you. I love meatballs. I love balls of meat. I'm in heaven. holy crap. sausage meatballs?! how did i not ever think of this? or hear of this? you have literally blown the top off of my culinary mind, grace. These sound great, and easy too. How can you go wrong with sausage? Ohhh... now that would be a good meatball!!! Meat and cheese? All in one little delightful ball? You are the Recipe Goddess. This is a new one...only flour huh? We make something similar, my husband loves them. Given the meatball-centric themes of your last few posts, I am picturing your kitchen as a boulderfield of meatballs :) These may be my favorites so far; I like the sausage addition! Happy New Year! OMG - they're like atkins friendly biscuits! lol. Is there grease left over? Can I make country gravy to pour over them? Will there be a stretcher next to it all after my impending heart attack? Josh will love these!! Maybe I will surprise him one night! How can you go wrong with something that has sausage and cheese in it? I can't think of a single way. Great job! This is really a fabulous idea. That Mama-lama-ding-dong knows what she's talkin about! Those balls o'meat look great! I'd be willing to give 'em a try with pepperjack. All I could think about when reading these two posts were The Delicious Dish skits from SNL...you know, schweaty balls! They sound great, and I would love to be eating them right now. You had me at Cheddar Cheese! I love how simple but also very unique this is! How cool, it's like you get the biscuit and sausage in one :). Very cool, I approve! I must confess that I tried to make these once before and they were very dry and crumbly, I never really figured out as to why that was. Yours look wonderful, so much so that I think I will give it a try again someday. These certainly sound easy and simple to make - must be wonderful on top of a big bowl of spaghetti. Yum!! I didn't know such things existed. I'll have to keep this in mind and maybe try out the recipe with some fake ground meat. Tasty sausage and cheese form into balls...mmm... These sound great! Somehow balls o' meat sounds so much...naughtier...than meatballs. I rarely like the meatballs I make, although 2 cups of cheddar cheese might do the trick. I used ground pork and added a bunch of spices, biscuit mix instead of flour, and sharp cheddar cheese. Oh, and an egg. They turned out so delicious. Oh, wow! These would be a huge hit at my house. They look sooooo good! OMG! I grew up with my Mom making these for us! I still make them to this day. Glad to see you post about them! It makes me want them right now! For those of you having trouble with the consistency when it's time to roll them into balls: I added 2 EGG WHITES, and the consistency became perfect!!! What a simple, low cost recipe! I am using this for a family Christmas party.